The DIVA of TINY FOODS: A GREAT PAELLA RECIPE and so much more! A GREAT PAELLA RECIPE and so much more! 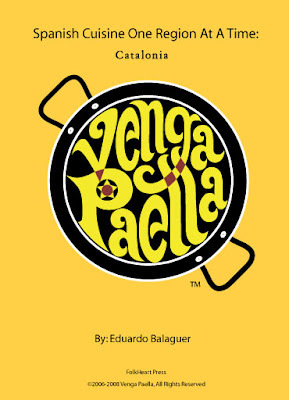 I was looking for a recipe for paella and found this great e-book the other day from Folk Heart Press called "Spanish Cuisine One Region At A Time" by Eduardo Balaguer. I downloaded it and discovered, to my happy surprise, that it was a great e-recipe but it was also so much more! Mr. Balaguer included a great history of the region where the recipe came from, there were maps and great sections on local chefs. The Paella recipe was not only detailed and precise, it came with serving suggestions, tips for turning the entree into a full meal, including wine and dessert suggestions, and even resources! The photo gave me a good idea of what my dish should end up looking like too! Amazing! I got what I thought was a recipe book and ended up with so much more. As for the recipe? Oh my God, one of the best Paella dishes I've ever had, even if I did make it myself, lol. For $5.95 I got a little history, a good read, some great tips and information and the Paella recipe I was looking for. Oh, and ladies Eduardo is pretty cute too! "Spanish Cuisine One Region At A Time" is located for purchase at Folk Heart Press. If you have a Tiny Food question, please feel free to ask me in a comment and I'll respond back here in the comments section or in a new post! Buy Great Products at The DIVA of TINY FOODS Shoppe! Do you have a recipe you'd like to share? Do you like my recipes and my recipe cards? Let me know here - The Diva of Tiny Foods wants to know what you think! Are My Recipe Cards Free to Download? Yes, please do - save them all, print them out and keep them or wrap them with a pretty ribbon and use as a gift! However, please do not use them on your blog, website or for any commercial purpose. All postings and original art by PopArtDiva.com, copyright 2000-2019. This blog is for entertainment only. All links provided are for the convenience and amusement of the blog visitor only and not to be construed as endorsements of any form. Sharing recipes of my favorite foods and snacks. Subscribe 2 Posts Via Email! MINI APPLE BETTY BAKES - Tiny Food Dessert! CHOCOLATE COVERED PEEPS - That'll Fix 'Em!